Finca with 2 single-family homes and 2 Apartments, 7 bedrooms, 5 bathrooms, 4 kitchens, 4 living rooms and 6 terraces. 4,600 SQM FINCA WITH 2 HOUSES AND SWIMMING POOL. 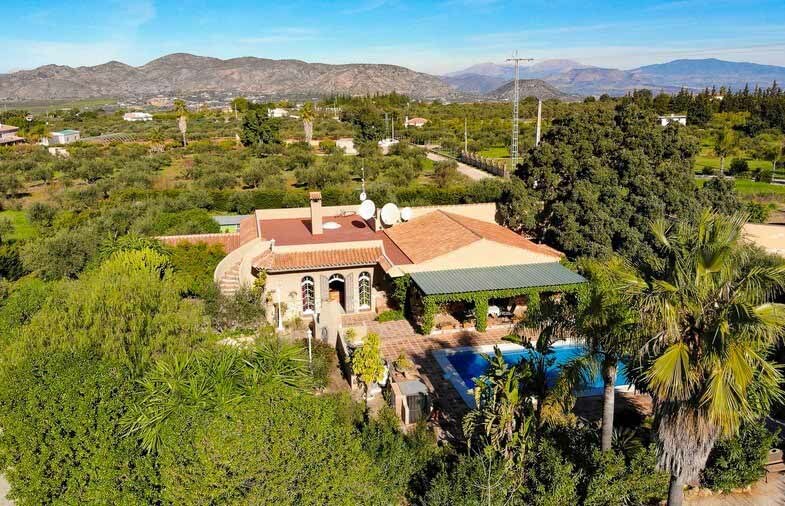 This finca is situated in the tranquil countryside of Andalusia between Malaga and Marbella, only 1 km from the Lauro Golf Course! Both houses belonging to the Finca are approximately 25 metres apart and are visually covered from one another as well as from the outside, which guarantees a sphere of privacy for all inhabitants. The houses each have a roofed patio with a barbecue area and a sun terrace, as well as roofed parking spaces for several cars. Furthermore 2 furnished guest apartments with individual entrances exist on the property. Both apartments are equipped with a fully furnished kitchen and a bathroom with a shower. The houses and apartments are connected to the municipal water and there is also a well on the property of the finca. The whole site consists of approximately 5,000 sqm and is completely fenced in. Along the fence more than 1,000 cypresses, 2.50 m high were planted. The finca has 2 separate entrances with an electronic gate each, as well as an intercom. The beautiful garden with its many palm trees, tropical plants, numerous fruit trees and ancient olive trees is enticing. In the middle of the finca there is a swimming pool with a sun terrace. This pool has an outside shower, lighting and proper pool steps, so that also a physically handicapped person can easily access the pool.